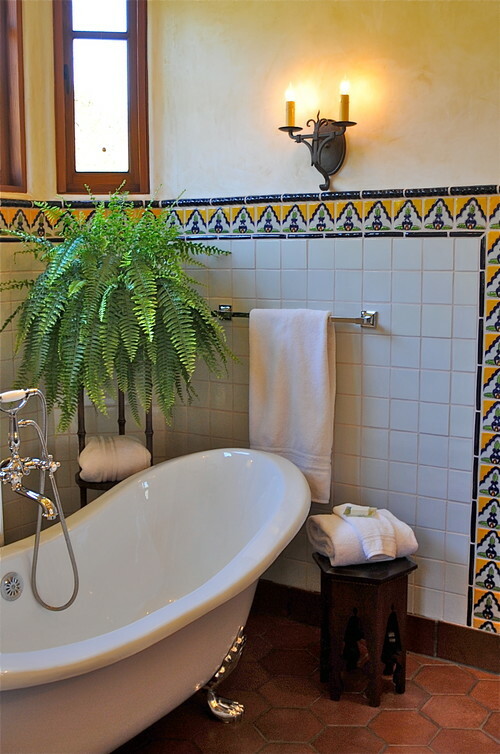 Spanish-style bathrooms are trending now more than ever before. I personally think it’s because we are all falling in love with rich patterns and textures. Spanish decor achieves that better than anyone! The bright and bold colors in the tiles mixed with the unique shapes make for a beautiful arrangement. If you’re wondering, "Can I achieve this look in my non-Spanish styled home?" you can! It’s all about using elements of this gorgeous look in your bathroom. Here are a few ideas for you! 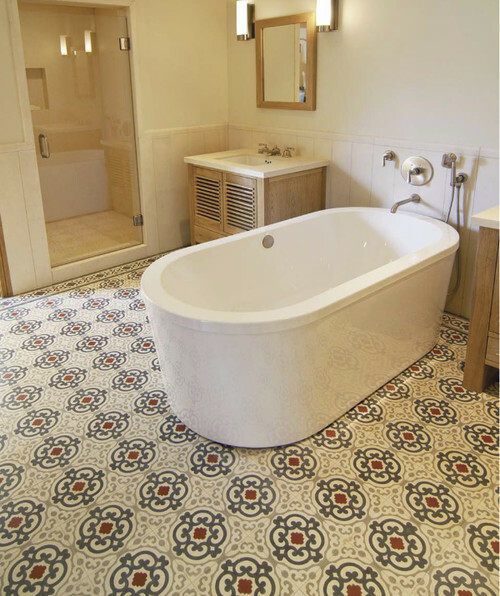 The best way to introduce Spanish design in your bathroom is through tile. There are so many color and pattern options available. You can choose something muted, or vibrant. Pretty much anything that captures your eye - or heart! Adding light wood elements is another fantastic way to introduce this look to your bathroom. You can do this by adding wooden trays or wooden jars. Or if you’re really feeling handy, add an all wood vanity to the mix. Have fun with the mirrors that you choose! I love looking for mirrors at antique shops or flea markets. You can find some beautiful, classic options that will look stunning in a Spanish inspired bathroom. Also, think outside of the box with shapes and colors. Plants make everything better! Seriously. And they add so much rich color. I love displaying plants near Spanish-style tiles. It’s a stunning partnership. Ferns do really well in the bathroom because of the humidity from the shower. This style really can go anywhere in your home! Be inspired, and most importantly, have fun. Kitchens come in all shapes, sizes and colors. They come in a wide variety of personalities and finishes. This is what makes designing a kitchen so fun! One detail that can bring the space together is lighting. Choosing the right lighting is everything. And one spot to highlight for great lighting is the island. This can become an anchor point for your kitchen. Some prefer a few bigger pendants, others prefer multiple smaller pendants. I’ve highlighted a few of my favorites in this post. Two large pedants is always a good idea! I love this look for so many reasons. It anchors the room and the large scale brings a good amount of visual weight. Choose two that have a similar finish with the hardware. Or choose something entirely different for a unique, modern look all your own. If you want to go really playful, add a track with a number of lights! This is such a fun look and creates a very industrial feel. I normally love to design things around the number three. Three small to medium sized pendants is another winning decision. This works fantastic when displaying lights above a really large island. And again, choose a finish that will knock your socks off and make a statement! Speaking of finishes, some of my favorite options are brass, matte black, copper, chrome and powder coated white or black. These copper pendants look fantastic up against this black and white kitchen. It’s all about mixing and matching in the name of taste! There are some obvious color choices when it comes to the kitchen. Black, white and grey can be safe yet beautiful choices. These three neutral colors allow for other bolder colors to be layered on. Another big kitchen color trend is blue. Deep blue and light blue have both been highlighted in the kitchen space. One color that is slowly making an entrance into the kitchen is green. There are subtle ways to introduce green to your kitchen. Here’s a few options for you! Let’s start with the easiest way to infuse green in your kitchen. Plants! That’s right, folks. As easy as that, you can add deep tones of green to your kitchen space. Display greenery on your island, on your shelves and near your kitchen sink. You’ll love the look! Accent walls are still a good idea for adding color. Try painting a wall in your kitchen a deep green. It’s another simple idea that is also budget friendly. If you have a kitchen island, play around with it by painting it green. Deep greens look classic and warm, while lighter greens are modern and fresh. Right now, I am all about the deep, moody green! If you really want to go bold, paint your cabinets green. I love the look of the upper cabinets painted one color and the lower cabinets painted another color. It can break things up and look really fun and fresh. What do you think of using green accents in your kitchen? Share your thoughts with us in the comments below! I am totally crushing on this new trend of painted ceilings! Painting your ceiling the non-traditional white can be the absolute perfect pinch of spice your home has been looking for. It’s creative, fun, and most importantly, easy. I have always said and will continue to say, paint is the easiest and cheapest way to transform your home. I have 4 examples of painted ceilings to share with you today and my thoughts! You may be surprised that anyone would want to paint their ceiling black in fear of making the space feel too small or dark. However, painting your ceiling black not only gives your room a chic feel, it also can help take an overwhelming amount of space and make it feel much cozier. This trend does extremely well in monochrome styled homes. Hallways are absolutely perfect for this trend! Do you have a hallway in your home that no matter what you do to it, it remains a bit…. um, boring? Paint that ceiling a fun color and boom, you finally have a hallway worth standing in! Another great spot for a colorful ceiling is your children’s playroom. Why not make the playroom even more playful with a fun pop of color on the ceiling? This room may be a bit busy for my taste as I always believe less is more. However, what is great about this space is that they used their orange ceiling color as the central accent and carried it throughout the room. Finally, if you have beams on your ceiling, painting a color in between will instantly give your ceiling a fun design. If white beams are a bit busy for you and aren’t your thing, don’t be afraid to cover those bad boys up with the same color. Covering the beams with the same color will give your ceiling more dimension without the added design. Today we are drawing our focus to the bathroom. 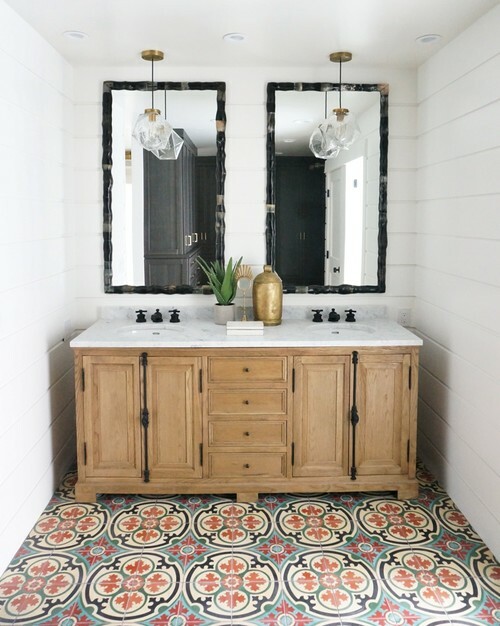 There are so many directions and themes you can go with when designing and adding decor to your bathroom but today we are zeroing in on vintage-inspired bathrooms. I have four images here for you and for each on a tip to draw from its example. Enjoy! 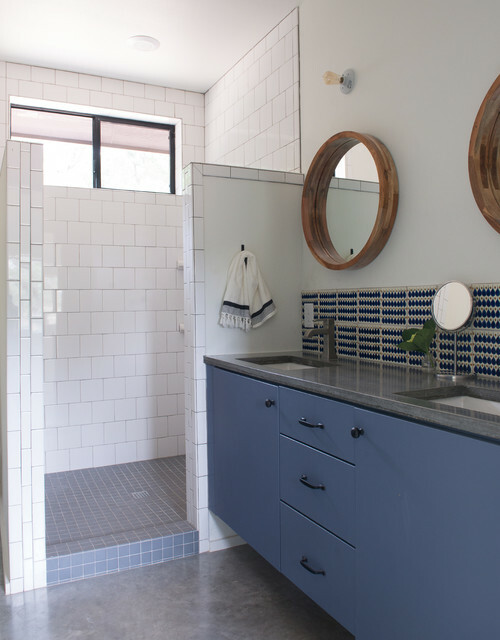 This modern bathroom is perfectly melded with vintage accents. The first three vintage-inspired items my eye is drawn to in this space is the wallpaper, the light fixture, and the faucet. These three things are a perfect tip in itself. Choose just a few items of your design to go the vintage route with to get that perfect blend of vintage and modern. Here we have a far more modern bathroom with just a pinch of vintage. The clean crisp lines in this bathroom give it its modern feel, the color brings in an extra fun element, and the shape of the mirror brings in that vintage touch. The tip I have for you here is this- mirrors are a perfect and an extremely easy item to go vintage with. It can even be fun to source your own mirror from a high-end thrift shop. I’ll keep it sweet and simple with this example. Gold and marble, boom. If you add marble and a dash of gold you are instantly on your way to a vintage-inspired bathroom. There is a lot of texture and patterns going on in this bathroom so I would like to zero-in on one. The walls. I love this worn cement-like look on the walls. That worn look is what I attach to our overall theme of vintage-inspired bathrooms. “Worn” anything such as tile, art and metal fixtures are all great things to add to get a vintage feel.